Director – Michael Reeves, Screenplay – Michael Reeves & Tom Baker, Additional Material Written by Louis M. Heyward, Based on the Novel The Witchfinder General by Ronald Bassett, Producers – Louis M. Heyward, Arnold Miller & Philip Waddilove, Photography – John Coquillon, Music – Paul Ferris, Special Effects – Roger Dicken, Art Direction – Jim Morahan. Production Company – Tigon. It is 1645 and England is torn in the Civil War between Charles I’s Royalists and Oliver Cromwell’s Roundheads. In East Anglia, former lawyer Matthew Hopkins rides through the midst of this, brutally hunting down witches and collecting a hefty fee from magistrates for doing so. When Hopkins comes to Brandiston to try the parish priest John Lowes, Lowes’ niece Sara gives herself to Hopkins so that he might spare her uncle. Despising Hopkins for his weakness in sleeping with Sara, Hopkins’s assistant Stearne rapes Sara and hangs her uncle. Sara’s beloved Richard Marshall, a cornet in Cromwell’s army, swears vengeance on Hopkins. Michael Reeves was briefly hailed as the young wunderkind of English horror. This came about as a result of his work on two Italian-shot horror films, the uncredited direction of Castle of the Living Dead (1964) and then debuting with Revenge of the Blood Beast/The She Beast(1965), followed by the excellent The Sorcerers (1967) but most of all with Matthew Hopkins – Witchfinder General (which is usually just abbreviated and known The Witchfinder General by reviewers). Sadly, Michael Reeves had such promise shattered with his overdose from barbiturates the following year – at the age of only 25. 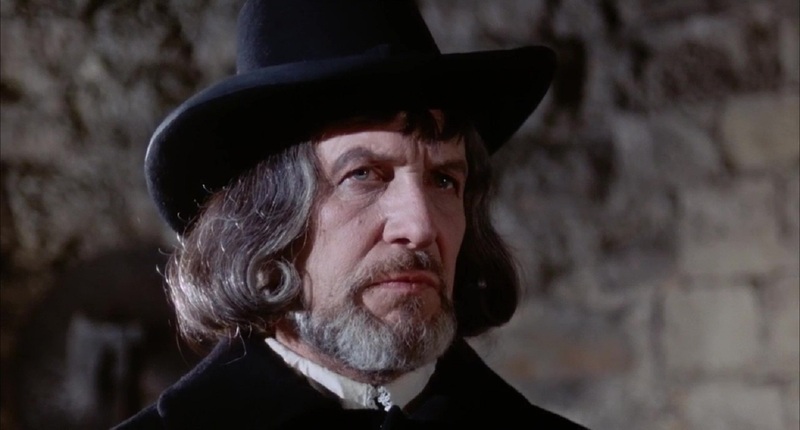 Reeves died during the midst of pre-production for The Oblong Box (1969) and Matthew Hopkins – Witchfinder General was last film. 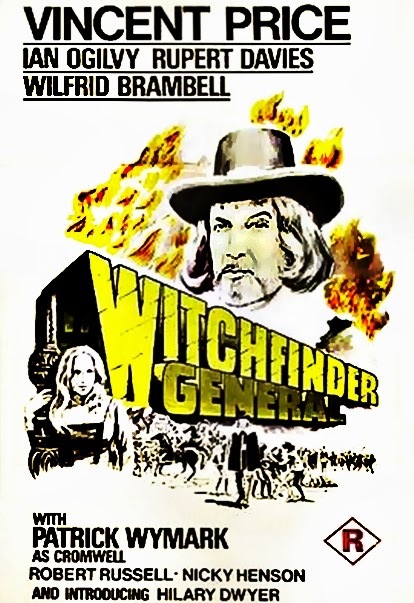 Matthew Hopkins – Witchfinder General is solidly rooted in fact – Matthew Hopkins was a real figure who rode through England trying and putting some 230 purported witches to the death in a 14 month period between 1645 and 1646. The film is based on a 1966 book that is a non-fictional work of historical research (although the film does fictionalise many aspects of the story for dramatic purposes – while Lowes did exist, the character of Sara and Richard Marshall’s oath of vengeance are invented). Michael Reeves sets out to portray the barbarism of the 17th Century witch-hunts. The scenes depicting the persecutions of witches are stark and alarming – the pitchforking of witches or winching them down the side of a bridge to see if they will float; the lowering of one victim down into a fire on the end of a ladder. Reeves hits in from the opening scenes with a witch being dragged through the streets by an angry mob, the priest reading the Bible untouched by pity, and the nailing of the gallows up on the hillside where the woman is left swinging at the end of a creaking rope. The other notable thing that Michael Reeves manages to do is get a straight performance from Vincent Price who twists his silky overwrought method of playing toward a hard and cold arrogance. It is a striking performance and one that is all the more effective for being free of camp and placed in such grim surroundings – it has been called Vincent Price’s greatest performance and probably is. For all the brutality and effectiveness The Witchfinder General has, it is a film whose reputation one cannot help but feel has been overrated. The middle, which is taken up by the various parties’ runnings around and fallings out, drags from lack of significant plot development. Furthermore, the film never concerns itself with any sociological or historical analysis of what it was that led to the conditions under which the witch-hunts occurred. 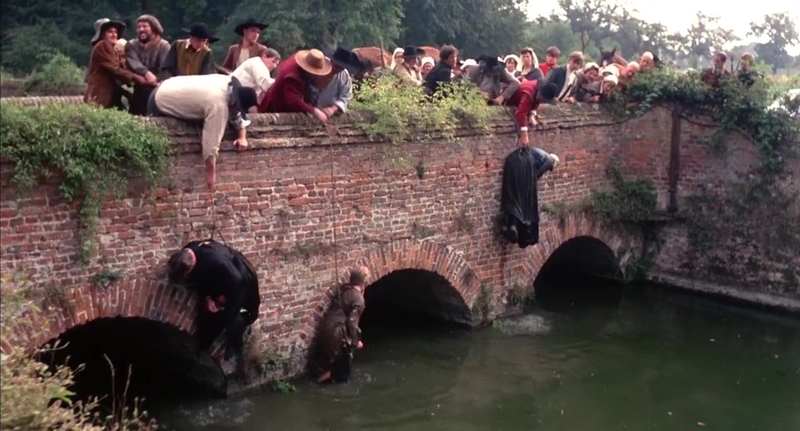 The Witchfinder General was influential – it sparked off a spate of witch persecution films, notably Mark of the Devil (1970) and sequel and works of the notorious Spanish exploitation director Jesus Franco such as The Bloody Judge/Night of the Blood Monster (1970) and The Demons (1972), which were mounted with a sadistically voyeuristic hypocrisy that took great delight in depicting scenes of witches being tortured. In the USA, the film was retitled The Conqueror Worm, after the 1843 Edgar Allan Poe poem, which was an allegory for life and death (the ‘conquering worm’ is a metaphor for the worms of the grave). It was clearly an effort to capitalise on the name of Vincent Price and sell The Witchfinder General as another of the Edgar Allan Poe films that came into vogue following the success of Roger Corman’s The House of Usher (1960). Vincent Price was hired to narrate the Edgar Allan Poe poem over the opening credits to legitimise the connection.